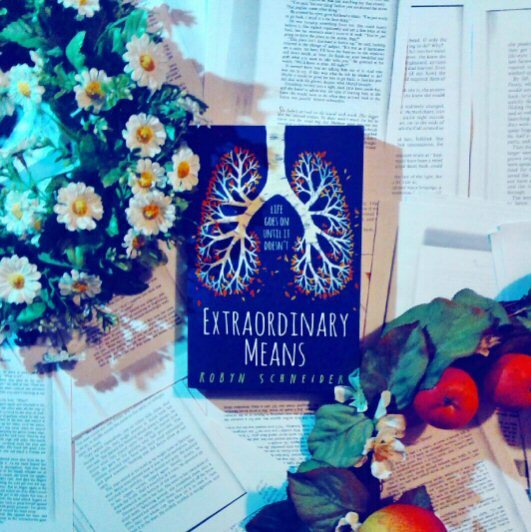 Extraordinary Means is the extraordinary story of a band of sick teens who struggle to find health, love and happiness in a futuristic/metaphorical/contemporary world. Well, first of all, let me say this: don't read it if you don't want to get your heart broken. However, if you don't have a problem with that, and you do pick this beautiful book up, you will end up loving it. It is a hymn to hope, human endurance, and complicated relationships, all given with the intricate and sometimes lyrical writing style of the author. Although much less gruesome than her last book, Severed Heads, Broken Hearts, this book is more poignant in my opinion, as well as powerful. I loved the portrayal of first love, teen angst and death struggles - it was so realistic. And I think I prefer that the disease is a non-existent one, it was a nod of respect to victims of real diseases, which I always find really tasteless when done in books (as a sufferer myself). I loved reading this book, and, although I would definitely have preferred that it had ended in a completely different way, it did leave me with the taste of hope on my lips, which is a pretty hard thing for a book (or pretty much anything) to do these days.